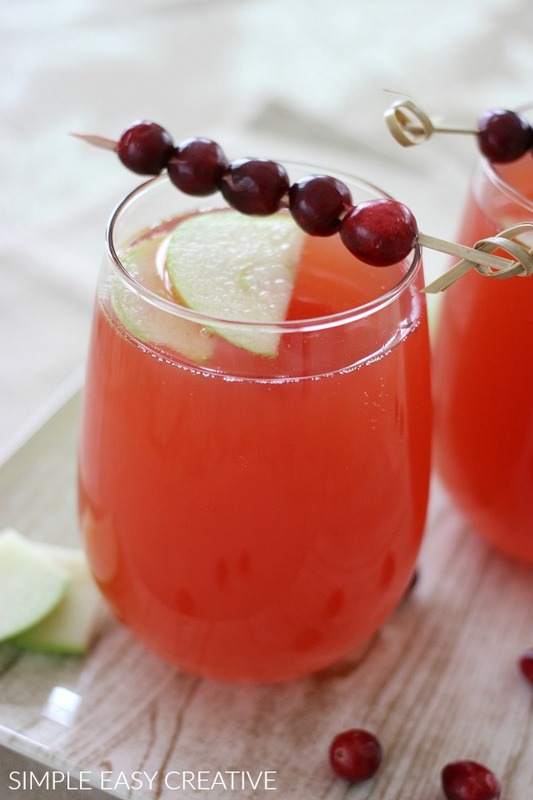 Serve this Cranberry Apple Spritzer along with your Thanksgiving or Christmas dinner. The kids will feel extra special, but don’t worry, it has no alcohol in it. Mocktails are all the rage now, at least according to the Cooking Channel. And I couldn’t be happier, since I’m not much of a drinker myself. 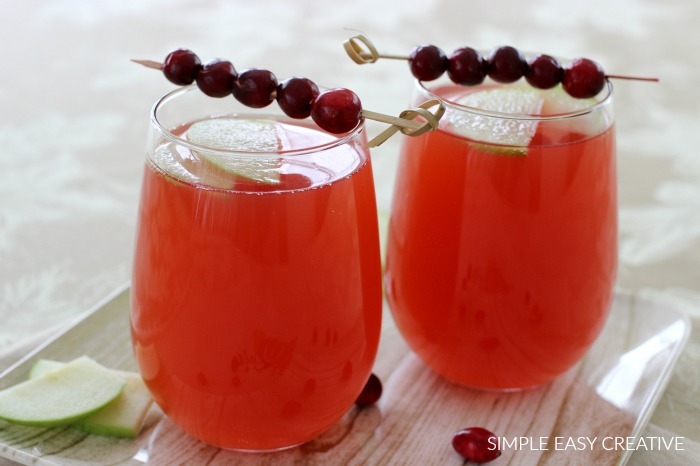 This Cranberry Apple Spritzer takes just 3 ingredients and goes together in a snap making it the perfect drink to enjoy with your Thanksgiving or Christmas Dinner. Often times, the drinks get overlooked during the holidays. With all the other food that needs to be prepared, the drinks are often an after-thought, at least in our home they are. 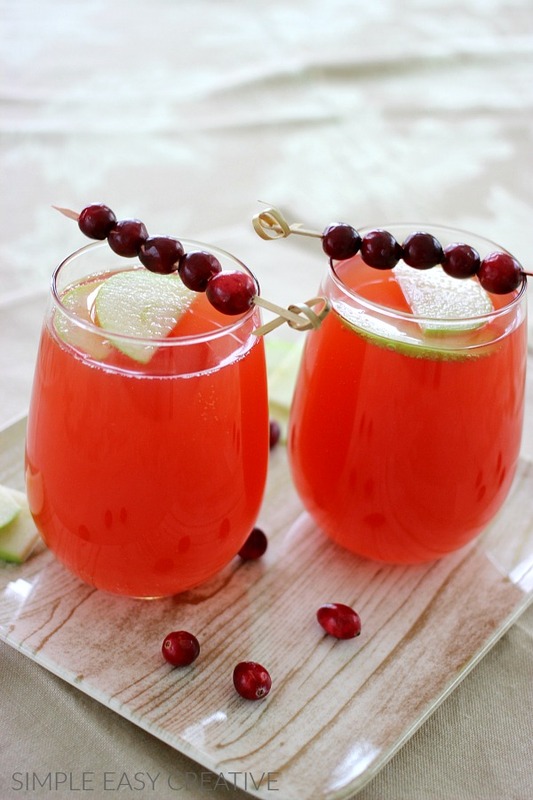 So keeping it super easy is the key, and these holiday drinks have only 3 ingredients – Cranberry Juice, Apple Cider (or juice) and Lemon Lime Soda. Pour equal parts of juices into a pitcher. This will depend on how many you are serving. At this point, you can mix and place in the refrigerator until you are ready to serve, or serve right away if the juices are chilled. Tip #1: For garnish, thread fresh cranberries onto a short skewer and slice apples very thin. Tip #2: To determine how much liquid you will need – plan on each person drinking 4 glasses. The amount will depend on the size of the glass, but for this example, let’s say your glass holds 8 ounces. 1 gallon of juice will have 16 – 8 ounce servings. So for this recipe, if you purchase 2 gallons of juice (1 cranberry and 1 apple cider or juice) that will give you 32 servings PLUS the soda. For one 2-liter bottle of soda, you will get 8 – 8 ounce servings. Let’s put the math all together – 2 gallons of juice plus one 2-liter bottle of soda, will give you a total of 40 – 8 ounce servings. Tip #3: You can certainly add alcohol to make this holiday drink. I love that you can serve this drink to adults but also to the children. You could certainly add flavored vodkas like Cranberry Apple or Cranberry from Smirnoff. Or for extra flavor that does not contain alcohol, add Torani flavored syrups like Brown Sugar Cinnamon, Cinnamon or even Hazelnut, yum! When my boys were young, they loved sitting at a special table and being served a “grown-up” drink. It’s an easy way to make them feel special during a busy day like Thanksgiving. Love how you split up the meal between bloogers! Looks like a great meal. Thanks Erin! I’m really looking forward to Thanksgiving this year.